David Jeffrey is raring to go after overseeing a remarkable summer overhaul of players at Ballymena United. Anyone foolish enough to believe that the Irish League’s most successful manager’s near two-year sabbatical from the game may have in some way dulled Jeffrey’s desire for success will have had that notion dispelled after a whirlwind summer of transfer activity. No fewer than 10 new faces will kick off the new season at the Showgrounds as Jeffrey gets down to the business of turning the perennial under-achievers into a force to be reckoned with. It has led to the light-hearted suggestions that the door of the manager’s office has been replaced with a revolving door – but supporters who heard Jeffrey’s impassioned speech at the club’s end-of-season awards function will be in no doubt as to his intentions. “There was no way I was coming back (into football) unless I thought we could be successful,” said Jeffrey. “It’s time to stop accepting mediocrity – we are planning to go forwards. “It will take time but I can promise you this – there will be no stone left unturned with regard to changing this club,” added Jeffrey. An obvious starting point for the manager was attempting to shore up the most porous defence in the Danske Bank Premiership last season – the ball ended up in United’s net a staggering 81 times in 38 league fixtures last term. Jeffrey’s response was to snap up three central defenders in Kyle Owens, Denver Gage and Johnny Flynn – the latter pair returning to the Showgrounds for second spells. 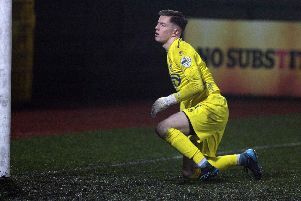 Jeffrey also utilised the loan market to secure season-long deals for Linfield left-back Danny Wallace and goalkeeper Ross Glendinning, who will compete with Alan Blayney for the number one position. Conor McCloskey and Fra McCaffrey have been added to bring attacking threat from wide areas after the departure of David Cushley to champions Crusaders. Up front, Johnny McMurray, Cathair Friel and Neil Lowry – back at his hometown club after a spell in professional football in Austria – will compete with Darren Henderson and homegrown teenager Matthew Shevlin to score the goals. “Bryan McLoughlin and I came in towards the end of the season, with straight forward terms of reference – to save the club from relegation. “Whilst we achieved that, alongside it we were trying to make assessments of playing staff here, but given the timeframe and circumstances we couldn’t manufacture opportunities to get everyone game time and therefore some got more minutes than others. “We had to make decisions on the best use of our budget and free up monies for squad development. The signings of Owens and Friel illustrate that Jeffrey isn’t afraid to dip into the lower leagues in an attempt to unearth some diamonds. “We looked at players who have shown high levels of ability in the top of the Championship and are ready to move up. Gage and Lowry bring added local interest as they return to their hometown club and Jeffrey insists: “We are particularly sticking to our aim that we want to see Ballymena men lining out in a Ballymena team to bring success to the Ballymena community. “All players have applied themselves well during pre-season training, but it’s genuinely more than building fitness, this is an opportunity for all players – current, new and promoted youth players – to stake a claim in this season’s squad,” added Jeffrey.